Thomas Ball, as a third year of medical school, found himself standing in a patient’s doorway, holding a ukulele. He scanned the room for IV poles and active interventions for the patient, who was blind and hard of hearing. Ball stood in the doorway and strummed a ukulele for a few minutes. Watching. Occasionally the patient would have trouble breathing. The end was near. In this moment, he remembered the days leading up to his own father’s death two years ago. His mom, sister, brothers and he sat with their dad 24 hours a day, decorating the room with flowers and pictures of their dog, Berkeley, creating an impromptu palliative hospice setting. Ball looked around the room before him. There were no decorations. No sympathy cards or remnants of a life that would go on in others’ memory. No one was here. No family. No friends. “Standing in the doorway,” says Ball, “I recognized this patient was at the end. He had no friends or family at the end of his life. All he had was the staff at the hospital. I walked in and, with his permission, sat down. Fifteen minutes turned into 30, and 30 minutes turned into more than 90.” From time to time the patient would lean forward, grimacing, displaying the same restlessness Ball had seen his father exhibit right before his death. Ball interspersed ukulele strumming with moments of silence. Thomas Ball, now a fourth-year student, refuses to accept this. Thomas started his higher education career studying finance, accounting and economics at William & Mary, building his resume to become an expert in mergers and acquisitions — about as far from playing the ukulele for a dying patient as you could imagine. During the first two years of medical school, students learn an enormous amount of anatomy, biology, chemistry, and science. For many people who go into medicine, nursing, physical therapy, or any of the healing professions, the first two years of school can take a toll. Too often the reason for being there is absent. All science, no connection. The human element is missing. And Ball was feeling that absence. He was burning out. 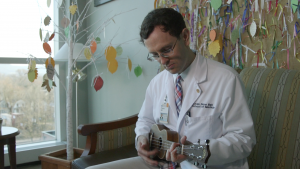 Thomas’ sister, who serves as a hospice chaplain in Hawaii, had introduced him to the sound of the ukulele a few years earlier. After seeing famous Hawaiian ukulele virtuoso Jake Shimabukuro play in Charlottesville, Ball had a chance to meet the performer, and that night Shimabukuro said, “If everyone played ukulele, the world would be a happier place.” In thinking about the ukulele, Ball realized that its small size, light weight, and simplicity of play might be something that could benefit him and his patients. 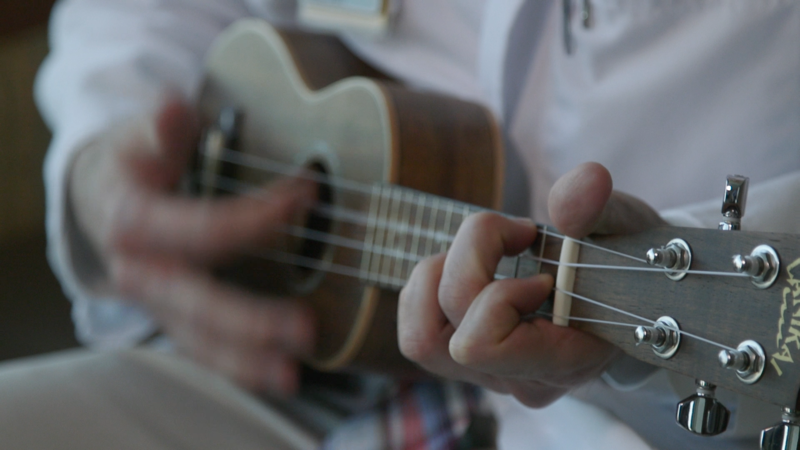 So, at a Compassionate Care Initiative event, he brought his ukulele with him and was invited to play. He played at the closing of the event, but it was really just the beginning. While we agree that everyone can show kindness and follow Thomas’ model for compassion and caring, we disagree with him when he says that the music gene skipped a generation. If the purpose of music is to touch the intangible — the soul, the spirit, the inner human — in such a way as to cause real emotion and feeling, be it excitement or ease, then Thomas may very well be as gifted a musician as they come.